Contractors or employees? It's the question that just won't die for Uber. A new national class-action complaint filed Sunday night against Uber in federal court in the Northern District of Illinois hopes to clarify the issue. It mirrors in several ways suits from Massachusetts and California, which were recently settled, with Uber agreeing to payments to drivers in those states that could total $100 million. The new suit, filed on behalf of former Uber driver Lorri Trosper by attorney Brian Mahany, who is best known for extracting a $16.6 billion settlement from Bank of America in a 2014 whistleblower case, would allow drivers from across the United States--though not in California or Massachusetts--to sign on. Uber's California and Massachusetts lawsuits dealt with the much-debated issue of whether Uber treats its independent-contractors too much like employees--without giving them the benefits a full-time employee can expect (say, paid time-off, overtime, health insurance). In the settlement, Uber agreed to more clearly communicate with drivers over how they can be cut off from using Uber's platform and provide a few more services to drivers in Massachusetts and California. Mahany tells Inc.com that watching the settlement come in late last month made him feel "very disappointed." "They basically threw some cash at it," Mahany said. "Obviously we don't think it was fair to drivers and we want to see some national resolution of this." Since the April 21 settlement, a handful of other complaints have popped up around the country--this Northern Illinois one, filed on behalf of hundreds of thousands of drivers nationwide, being the most recent. It asks the court to require Uber to classify its drivers as employees, and to award drivers unpaid overtime and expenses, as well as unpaid gratuities, plus equitable relief. 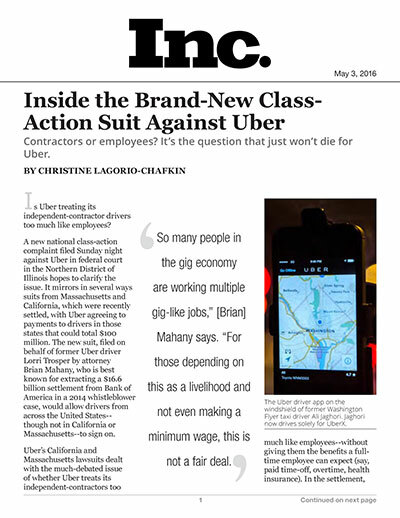 "So many people in the gig economy are working multiple gig-like jobs," Mahany says. "For those depending on this as a livelihood and not even making a minimum wage, this is not a fair deal." Uber's reply to the complaint is essentially the same statement it has been giving in response to journalists' questions about the earlier class-action suits, and to any issues involving the employee-contractor question for almost a year. Uber: "Nearly 90 percent of drivers say the main reason they use Uber is because they love being their own boss. As employees, drivers would have set shifts, earn a fixed hourly wage, and lose the ability to drive with other ridesharing apps--as well as the personal flexibility they most value." The new Illinois complaint uses former Uber driver Lorri Trosper as the plaintiff, and makes the case that she is treated like a full employee--while being classified as a contractor. "Tellingly, all that she does for Uber is directed and monitored by Uber. She does nothing in her day to day work activities that would evidence her being independent of Uber. All that she does in her job is controlled by Uber. She is not independent of Uber but is an employee of Uber," the complaint reads. The complaint also alleges that Trosper, while driving for Uber, earned gratuities, "which Defendants stole from her. When not stolen, she lost gratuities that would have been paid but for the communications of Defendants to Uber drivers and Uber customers dissuading the practice." When we started Uber six years ago, we thought long and hard about whether to build a tipping option into the app. In the end, we decided against including one because we felt it would be better for riders and drivers to know for sure what they would pay or earn on each trip --without the uncertainty of tipping. That's still the case today. Officially, tipping is not included, nor is it expected or required.